Provides an ideal alternative to pivot floor springs. 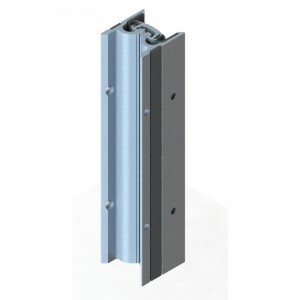 This solution is ideal for doors that need to swing 90° in both directions (180°) and eliminates the possibility of pivot doors splitting on impact. It provides an ideal solution for busy corridor doors which are exposed to impact damage toilet/shower room doors where there is a risk of barricade or patients collapsing in the room. Intastop’s Double Swing Continuous Geared Hinge is available with an anti-vandal Concealed Closer, which can either be frame or floor mounted with a closing force size of 3-6. The closer is suitable for leaf widths up to 1100mm, its closing speed and latching action is adjustable and comes complete with a safety valve to prevent deliberate overloading. It has a closing range from approximately 180° and is CE Approved in accordance with EN 1154:1996 +A1;2002 and Certifire approved in accordance with EN 1634-1:2000. UK Patent GB 2451 276A. Distributes loads stress uniformly along the full length of the door and frame. Available with anti-vandal concealed closer. Ideal for doors that need to open 180°. For doors up to 160kg in weight.